Rollin’ Rollin’ Rollin’ Keep them doggies movin’ Rawhide! The tune kept running through my mind as the mass of huge gray-matted beasts crested the hilltop– hundreds strong, all galloping straight toward me- or so it seemed. Rewind to a few weeks ago, when I was lucky enough receive an invitation to participate in South Dakota Governor Mike Rounds’ 43rd Annual Buffalo Round-up at Custer State Park, easily one of the most exciting adventures of my lifetime. Although it is great fun & games, the real purpose is to keep the park’s free-roaming bison population, which number around 1500 by the summer’s end, on a par with the available grassland forage, which supports only about 1000 bison for the winter. The process begins when the whole herd is driven into the corrals by a handful of expert cowboy and cowgirls on horseback assisted by park rangers in pick-up trucks (and me.) Next the rangers brand, vaccinate, and select about 400 buffalo for the November auction releasing the rest back into the park. The sales revenue helps support this 71,000-acre park, home to one of the world’s largest publicly-owned bison herd park. We check into the very comfy Custer State Park Game Lodge which is our headquarters for the three-day event. Things start off innocuously enough with a gigantic pancake breakfast at the lodge’s adjacent fairgrounds. There is a wide selection of booths where local artisans make and sell everything western; from buffalo nickel jewelry to assorted leathercrafts (loved those chaps), and some deliciously chewy bison jerky. Buy a fresh bison burger from one of the food booths and mosey over to the stage where you can listen to top country musicians, hear tall tales spun by cowboy poets, or watch dancers performing everything from clogging and square dances to Native American drummers and flute players. The Buffalo Wallow Chili Cookoff is always held the day before the roundup- kind of like a big group pasta feed before the marathon. The competition is fierce, and many competitors come dressed in costume complete with their own cheering section. Each of the 30 contestants is given eight pounds of buffalo meat and then anything goes. Judges consider the resulting flavor, texture, consistency, aroma and blend of spices when choosing the winner. Suggestion: Come hungry for tasting & bring Tums. You’ll want to make it an early night because the roundup gets going at dawn. It’s still dark when we’re driven to the corral area where the visiting journalists and filmmakers are assigned to the back of a pick-up truck. Each truck is driven by a trained park worker, who has been given careful instructions and will be in constant phone contact with the other vans. We drive along the back roads to take our assigned place along the Wildlife Loop road. Although it’s still early there are already thousands of spectators lining the two choice hillside viewing locations. After all the trucks and horses are positioned just so, we hear the crackling voice over the walky-talky giving us the green light. We whoop and holler, emit ear piercing taxi-cab whistles, while those on horseback are waving their hats and cracking whips to get the pack moving in the right direction. For the next hour we weave in and out of the undulating bodies, (trying desperately to hold on and not get bounced out of the pickup bed) trying to cut off strays that decide to make a run for it. Right in front of us, two particularly massive old bulls (each had to weigh almost a ton) decide to have a turf war (boys will be boys) and engage in a horn-to-horn wrestling match. Then in the blink of an eye, they stop their fight and both come charging straight at our truck. Our unflappable woman driver shrieks, “Hold on,” guns it and we escape by a bison hair, circle back and head after the culprits. Yeehaw! After plenty of heart thumping excitement, the bison are all penned and ready for the selection process. Dusty and banged-up, we climbed out of the truck and hugged or high-fived each other, all jabbering at once about the incredible job we did as we saunter into the huge tent for some home-from-the-range cowboy grub– and a handful of aspirin. Roundup is Monday at the end of September or early October. Check website for exact date. There are many motel rooms in the nearby towns of Custer, Keystone and Hill City or campsites in the park but if you want a really comfortable stay right in the thick of things, I highly recommend staying in the Custer Park Game Lodge They offer a tummy-warming hearty buffet breakfast. 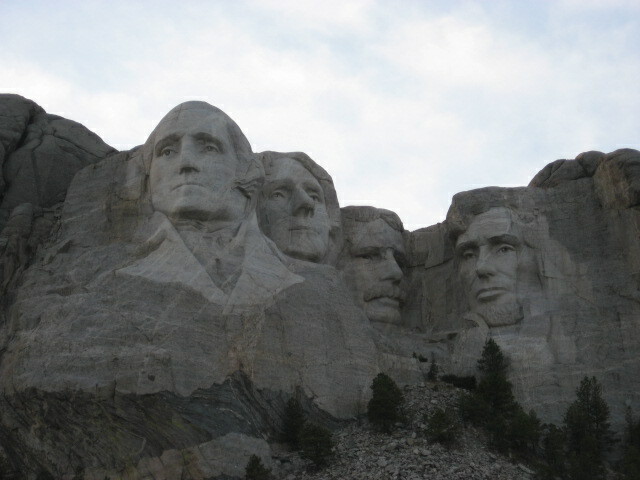 Mount Rushmore – View the inspirational sculpture of America’s big four presidents, one of the world’s most recognized symbols of democracy. Save time to explore the museum. Crazy Horse Memorial —See the granite mountain that is being carved into the world’s largest sculpture in memory of the Sioux chief who led the attack on Custer’s men at the Battle of Little Bighorn. 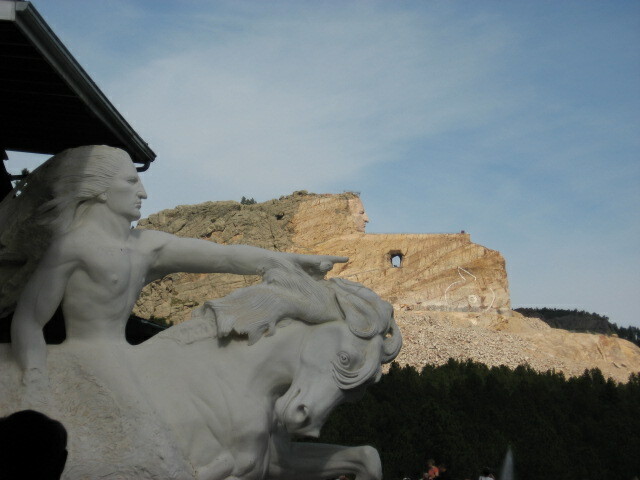 Hop the 1880 Train Ride a vintage steam train through the Black Hills of South Dakota offering gorgeous views. 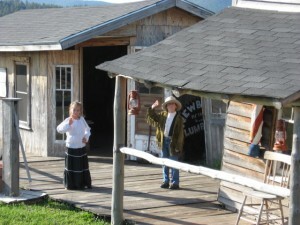 Four Mile Old West Town: Known as “the friendliest little ghost town in the Dakota Territory.” Wander through over 50 historic buildings including a saloon, jail, outhouse, schoolhouse, etc. as you listen to stories about the good old days. Prairie Berry Winery: This unique award-winning winery, makes a variety of traditional native grape wines as well as scrumptious dessert “prairie berry” wines using local rhubarb, chokecherry, and raspberries, etc. Open daily.